Mayor Lyda Krewson says she continues to have confidence in the leadership of the St. Louis police department despite seven officers being charged with felonies in two months. 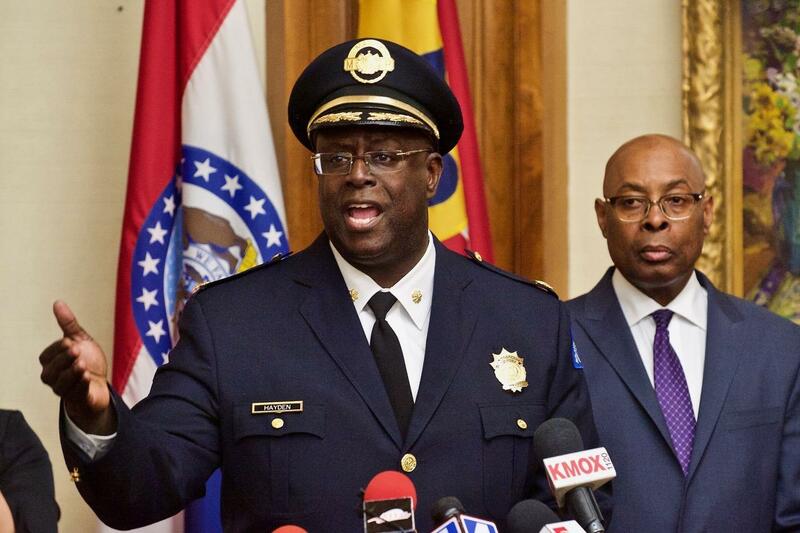 Mayor Lyda Krewson says she still has confidence in Police Chief John Hayden and public safety director Jimmie Edwards, shown here when Hayden was announced as chief in 2017. Krewson’s remarks were her first since one officer killed another last month. Authorities say Nathaniel Hendren, 29, was on duty — but out of his assigned patrol area — when he shot 24-year-old Katlyn Alix in the chest during a Russian roulette-style game. Alix, who was off duty, had gone to Hendren’s apartment — and Hendren’s partner, who was on duty, was also at the apartment. Hendren has been charged with involuntary manslaughter and armed criminal action. “The decisions that were made by those officers that day were clearly very disturbing, but I don’t think that’s what’s happening with all our officers every day,” Krewson said. Krewson on Thursday also announced that for the first time in 12 years, a medical doctor will lead St. Louis’ health department. Fredrick Echols will take over as director on Feb. 19. He is currently director of Communicable Disease, Vector and Veterinary Programs for the St. Louis County health department. Echols got his undergraduate degree from Clark Atlanta University and went to medical school at Boston University. Before he came to St. Louis, Echols, a Navy veteran, was the chief of communicable diseases for the Illinois Department of Public Health. The city’s charter requires the health director be a physician or have a master’s degree in public health. But Echols’ qualifications go beyond his credentials, Krewson said. “He’s someone with a proven background in practicing medicine, has expertise in public health and a large amount of management experience and expertise,” she said. Echols will be paid about $152,000. He replaces acting director Jeanine Arrighi, who took over the post in July 2018 when Melba Moore took a job in Cincinnati. St. Louis’ public safety director has offered a vigorous defense of his police department following charges against two more officers Tuesday and criticism from the St. Louis prosecutor in another case. Hayden’s comments, made Thursday in his first public appearance since just after Officer Katlyn Alix was shot and killed Jan. 24, are the latest in a tense dispute between police and prosecutor Kim Gardner. Updated 5:45 p.m. Friday with charges filed — An officer with the St. Louis Metropolitan Police Department has been charged with two felonies in the Thursday shooting death of another officer. Nathaniel R. Hendren, 29, faces involuntary manslaughter and armed criminal action charges in the killing of 24-year-old Katlyn Alix. The incident happened early Thursday morning at Hendren’s apartment in the 700 block of Dover Place in the Carondelet neighborhood. The St. Louis Health Department could soon be looking for someone to replace director Melba Moore, who has led the department since 2015. A Cincinnati board city board voted unanimously Tuesday to hire Moore as that city's next health department commissioner. According to the board’s chairman, the hire could be done as soon as the end of the week.